Violet-green swallow on a big feather that he may have carried up to feather his nest if he hadn't crashed into a window. A huge bag of goose feathers stands by my front door for the swallows. They use them to line their nests. When the swallows arrive in spring migration, they begin to build the nests and are on the lookout for materials. In May and June, if it isn’t raining, I grab a handful of goose feathers from the bag every time I go outside. 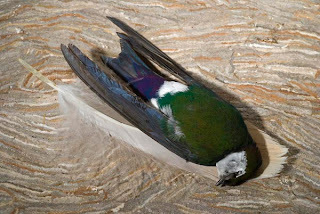 Feathers scattered on the ground attracts barn, violet green, and tree swallows. But they prefer to catch floating airborne feathers rather than swooping down face-first to grab them off the earth. So I blow feathers from a ten-foot plastic pipe into the air for the birds to snap up. The birds soon learn what I am up to when I pick up the pipe: they fly around and around, waiting for a feather to come out. I notice that from the beginning to the end of the season, their feather catching skills improve. They learn to grab them by the fluff at the front of the shaft and fly with them curved underneath their bodies. So I give them bigger and bigger feathers, even larger than the ridiculously large size of the feather pictured under this poor bird that crashed into a friend’s window.